Get Vendio Gallery - Now FREE! 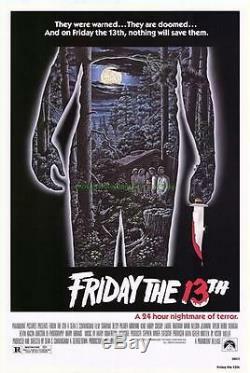 FRIDAY THE 13TH MOVIE POSTER ORIGINAL ONE SHEET!!!!!! Click to View Image Album. Friday the Thirteenth, the classic 1980 Sean S. Cunningham slasher horror mystery thriller They were warned... And on Friday the 13th, nothing will save them. "; "A 24 hour nightmare of terror. "; "You'll wish it were only a nightmare... The film stars Betsy Palmer, Adrienne King, Harry Crosby, Laurie Bartram, Mark Nelson, Jeannine Taylor, Robbi Morgan, Kevin Bacon, and Ari Lehman (as Jason Voorhees). This poster features Alex Ebel artwork. This poster was bought directly from Paramount's so called "Special Effects" catalog which had a original movie poster section. AND THIS REALLY IS A STUDIO ISSUE ORIGINAL ONE SHEET SIZE MOVIE POSTER at least in the sense they were for this catalog , the SPECIAL EFFECTS catalog PARAMOUNT PICTURES. It is not a NSS version 27 BY 41 INCH poster!! All the posters I sell are originals. I do not sell reprints. If you have any questions please contact me. If there is a problem with your order please contact me before leaving negative or neutral feedback. Thank you for looking and check out some of my other items. The item "FRIDAY THE 13TH MOVIE POSTER ORIGINAL ONE SHEET" is in sale since Sunday, April 12, 2015. This item is in the category "Entertainment Memorabilia\Movie Memorabilia\Posters\Originals-United States\1980-89". The seller is "dragonbirdlw" and is located in Van Nuys, California. This item can be shipped to United States, to Canada, to Mexico.